Chicken nuggets are practically a food group at this point, though no one is ever quite certain what’s in them aside from, well… chicken. 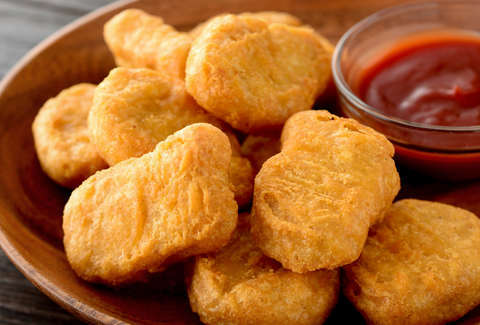 One thing we can all be sure of, however, is that rubber should never be an ingredient in your nugs, which is why a new chicken nugget recall this week is so alarming. Tyson Foods announced it’s recalling 36,420 pounds of chicken nuggets for potentially containing the unappetizing substance. The recall was issued on Tuesday after Tyson received several complaints about an “extraneous material, specifically rubber” in the nuggets. Per a CNN report, federal officials are urging nugget fans to check their freezers and toss any Tyson White Meat Panko Chicken Nuggets produced on November 26, 2018. The potentially contaminated batches, sold in five-pound plastic bags, have a use-by date of November 26, 2019 and a case code “3308SDL03.” They should also have an establishment number P-13556” inside the USDA inspection mark, the US Department of Agriculture's Food Safety and Inspection Service said. “These products should be thrown away or returned to the place of purchase,” the Food Safety and Inspection Service said. Tyson isn’t the only nugget-producer having problems. Perdue also issued a second recall in less than two weeks, this time on their Fun Shapes Chicken Breast Nuggets. The company claims about 16,011 pounds (or 21,348 packages) of its nuggets contain milk not listed on the label. Be on the lookout for 12-ounce packages with a use-by date of March 11 and lot codes 17009010-19009010. The milk-laden nuggets were produced on January 10, according to a report by USA Today, and have an establishment number P-369. They were shipped to stores in Connecticut, Delaware, Maine, Maryland, Massachusetts, New Jersey, New York, Ohio, Pennsylvania, Rhode Island, Vermont, Virginia, West Virginia, and Washington, DC. Perdue Vice President for Quality Assurance Jeff Shaw said the error was isolated during a specific portion of the production run, but the nuggets are being recalled as a precautionary measure. The company previously recalled nearly 70,000 pounds of frozen, gluten-free nuggets for potentially containing wood. No illness, injury or other adverse effects have been reported in any of the aforementioned recalls, but better safe than sorry.